For engineers in the business of manufacturing, designing or repairing electronic equipment, an oscilloscope is a fundamental tool that helps them analyze both single shots as well as repetitive signals which shoot across multiple channels. This, in turn, helps to recognize and spot any temporary event or glitch that may be causing the equipment to malfunction. 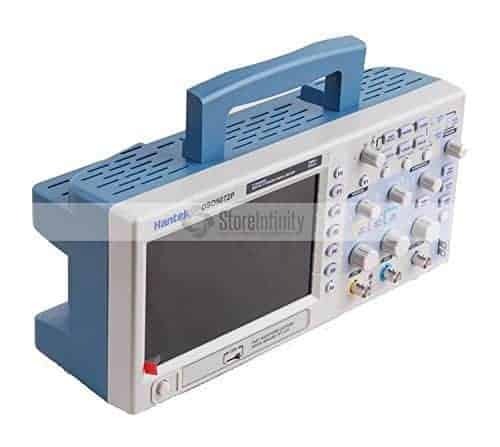 If you are reading this, then chances are that you are looking for a new oscilloscope or a replacement for one that has just kicked the bucket. Either way, we have you covered. An oscilloscope is a powerful tool that is used to measure signal voltages over time, which you can view by the wave shape. It can measure signal frequency as well as the maximum signal value. If your device’s signal varies, this tool will help you measure it. The basic use of this scope is relatively simple. After plugging it, you will turn it on and attach your input terminals then apply signals. Make sure the settings match. Although it seems easy, you will have to do some training to understand how to use this device and measure properly. Buying an oscilloscope is not an easy decision at all even if you may have purchased one in the past. In fact, you’d be amazed at the number of newer models that have arrived in the market since the last time that you had a look at it. 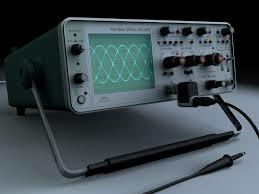 Oscilloscopes are used for several applications and in different industries. Some of the examples of professionals who may find this tool useful are medical researchers, automotive mechanics, physicists, television repair technicians, and hobbyists. Oscilloscopes are an integral tool for those testing, designing, or repairing electronic equipment. Digital storage Oscilloscopes have replaced their analog counterparts and are now the most common kind of scopes thanks to their improved measurement, storage, and trigger features as well as remarkable specifications. 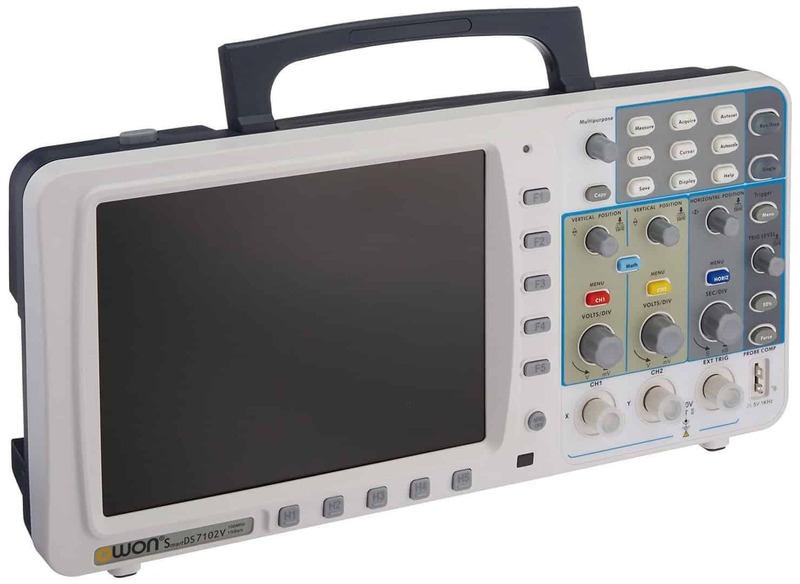 Digital Oscilloscopes come in handheld, portable, and heavier units and have impressive Benchtop design. To allow you to get a better understanding of some of the options you have, we have curated a list of the best ones that you can pick. The Rigol DS1054Z is one of the most popular all-purpose digital oscilloscopes among hobbyists as well as beginners looking for a versatile device that can be scaled as they progress with their skill sets. This is a 4 channel oscilloscope with a 50 MHz bandwidth that is more than sufficient for hobby grade electronics. But don’t label it off as a beginner device yet because it offers unbeatable value with its impressive feature set. A lot of oscilloscopes in the market can be a tad overwhelming to handle, especially if you are new to them. Not the Rigol. It is just the right size that allows you to carry it easily for your projects. The construction is solid and durable. The controls are minimalistic but do take some time to get used to. If you have used oscilloscopes before, then you should be able to sail through without any problems whatsoever. There is a single all-purpose rotary dial or knob that works as the option to choose all the controls. You just have to toggle through the menu. The LCD display is crisp, and it is impossible to miss out on any menu option even if you are flipping through them fast. The waveform capture rate is phenomenal and precise. While it has a 50 MHZ bandwidth, you can extend it to 100 MHz by entering a license code that you get from the manufacturers. You cannot misdiagnose an issue with your circuit with the Rigol. Power it on, get the license key, unlock some of the premium features and you are all set to tinker with your circuits. The Rigol is one of the most feature-rich Oscilloscopes at this price point. It boasts of a signal intensity setting that is comparable to analog scopes, a variety of trigger modes, excellent sample rate and memory, 30 hours of evaluation memory that is counted by the device ‘switch on’ time rather than clock time, Ethernet, USB and 4 channels. There is a reason for the popularity of the Rigol DS1054Z. It is a versatile feature bundle that is comparable to an Agilent or a LeCroy at a very attractive price point that makes it one of the best Oscilloscopes to consider. For hobbyists, students and professionals looking for a reliable 50 MHz scope that also has a bundle of other features, the Signlent SD1052DL is one of the best choices in the market. It boasts of a very sturdy and quality design, a large 7″ color TFT-LCD screen and a record length of 32kpts per channel which allows you to capture detailed waveforms. A bunch of triggers and a practical UI make this one of the best oscilloscopes at this price point. The Siglent is a very versatile scope, and one of the features that is often overlooked is a frequency counter. This eliminates the need to stack a separate frequency counter on top of it. The built-in counter is incredibly sensitive. It allows you to measure the oscillations to the T. A 500MS/s per channel sample rate and a 32kpts per channel record length with a bunch of triggers. This allows you to capture waveforms for a wide range of applications including, assembly lines, repairs, product design, services and electrical engineering. These features make this one of the most versatile scopes for the price. Like most other oscilloscopes in this range, the Siglent has a minimalist but easy UI that includes a single-knob for accessing most of the controls. While the Siglent SDS1052DL includes RS232 and USB ports for external communication, you can just connect it directly to the computer, install the drivers and capture the screenshots and even record waveforms. This is a lot easier than having to capture in the USB and then transfer it, which can be a tad cumbersome. The 7″ color TFT-LCD (480 x 234 pixels) provides a clear and crisp image and the built-in 8 x 18 division grid allows for perfect waveform views every single time. For capturing low-level signals, the Siglent SD1052DL features a 7.0nS rise time. This is further complemented by 2mV vertical sensitivity which makes this a perfect all-purpose scope. The Siglent is one of the best Oscilloscopes in its price range, and they are backed by one of the best customer support teams that helps you tackle any problems and are very responsive to queries. The scope itself is a very versatile, practical and durable one that has a rich feature set. Highly recommended. 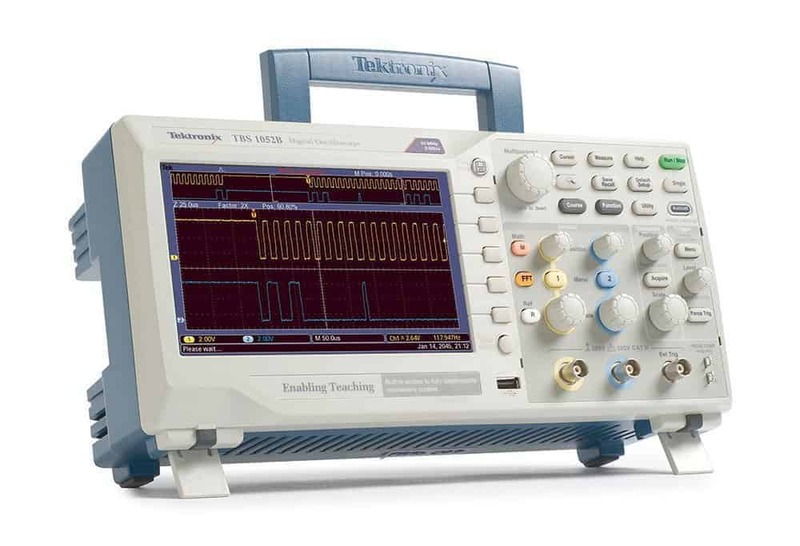 Often labeled as the tool of the pros, the Tektronix 1052B is one of the most reliable Oscilloscopes that you can invest in. It is one of Tektronix’s newer entry-level models that was launched as recently as 2012. But in the short time, it has emerged as one of the most widely used DSOs. At the forefront of its features are a very compact and durable design, industrial grade 7″ WVGA color LCD screen and a .8mm probe head that makes it possible to get readings even in the most limited space applications. As expected with a Tektronix model at this price point, the 1052B is packed to the brim with features. Highlighting them are the 50 MHz bandwidth which is more than ideal for beginner level scopes, 2 channels and a 2.5k point record length for each of them. In what can be termed as an intuitive design the 1052B has two USB-ports with the one on the front used for a USB stick and the one on the rear side of the housing to be used to plug directly into a PC. At under 2 kg, it is exceptionally easy to carry. However, it lacks a front-panel cover which may make it prone to damage or corrosion. The two colors when displaying both the channels on the screen makes it extremely easy to detect the activity on each channel. However, the 1052B has a painstakingly low 2.5 kB of sample memory which is clearly not even sufficient for handling more than a couple of data screens at best. The advantage of this though is that you have a very fast and responsive machine. There may be a few occasional occurrences of the screen freezing. But those are only few and far in between. The 1052B includes a lot more features than what you will ever use. Packed into it are two independent frequency counters and a bunch of math functions like the RMS calculations and Fast Fourier Transforms. This gives it the ability to continually measure up to 34 different values like peak voltage, RMS voltage, rise time, etc. While the FFT lets you use it as a spectrum analyzer that will respond to the changes that you make in the controls on the horizontal level. 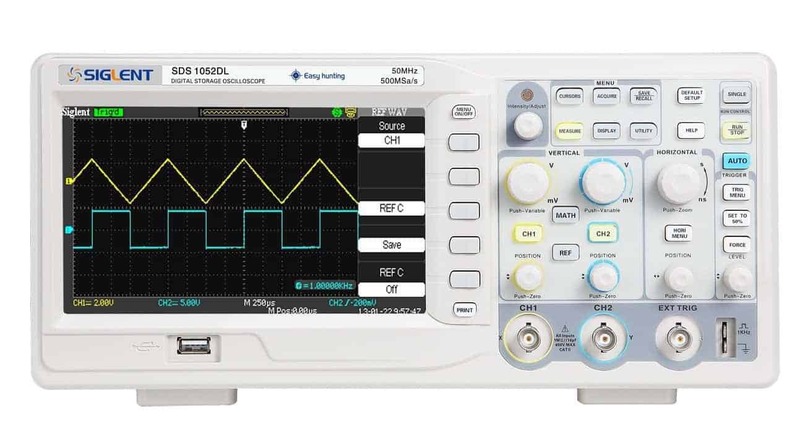 The 1052B is a great quality oscilloscope family that has some very good features and comes at a beginner price. It has Tektronix’s reliability to back it up with, and you cannot go wrong with these guys. With a very reasonable price tag (check current price ) and some amazing features that give you more bang for your buck, the Hantek DS05072P is being touted as a cost-effective replacement for some higher priced DSOs. It may not be a LeCroy or Tektronix. But for a home repair guy or a beginner with oscilloscopes, it offers enough features to serve all your basic repair and design jobs. For an oscilloscope at this price point, the 800 X 480 LCD screen is way better than what any other competitors offer. Club that with a built-in help menu, and you get a very easy-to-use scope with intuitive controls that won’t even overwhelm a beginner. You won’t have to go tutorial hunting for this one. The form factor is compact, and you can carry it with ease. It comes bundled with two 10:1 probes which are excellent in quality too. The Hantek DS05072P offers some great features that include a 70MHz bandwidth and a 1GSa/s real-time sample rate. The memory allows you to record up to 40k without slowing the oscilloscope down or creating any lag in the function. A bunch of triggers like edge/pulse, width and selectable video /overtime and the option to perform real-time analysis on a computer makes this a perfect scope for basic to medium level repair and design jobs. On the connectivity front, you have a USB port and one that can be connected to the computer. The package includes a software that can be used for real-time analysis. The DS05072P offers a bunch of automatic functions including four built-in math functions (FFTs standard). Clearly, this is more oscilloscope than what you can ever get at this price point. If you know what you are buying and what can be achieved with it, you will never be disappointed with the Hantek DS05072P. The Owon SDS7102 is a 2 channel 100 MHz oscilloscope that boasts of an SVGA port that lets you expand or enlarge the waveforms. The display screen itself is a robust – 8-inch high definition TFT. But what stands apart from the rest is the amazing deep memory that it boasts of. For a scope at this price point, 10M memory points is a selling feature. And that’s precisely what makes the SDS7102, a slightly better bet than the Rigol. The Owon SDS7102 is a neatly designed scope with a very compact form factor that allows easy portability. The controls are well organized and easy to access. The large-sized screen makes it impossible to miss out on a menu function like we have noticed with the Rigol, which is in the same price range. If you have spectacles and find the waveforms difficult to track on the small screen, you can always use the SVGA function to display it on a projector or on any large screen. There is a minor lag in the functions as you turn the knobs, but that is something that we have seen even on much higher priced scopes. It is nothing very annoying though and won’t slow down your project. The 2 channels and the 10M sample depth allow you to capture almost all the data that you will need while you are reviewing the waveforms. This makes life a lot simpler as compared to lower-priced models like Rigol. Captures are stored according to what you see on the screen. So, in effect, it isn’t possible to zoom in on the captures. Also, you cannot name the files. So if you are saving a lot of captures, you should be making notes and references so that you won’t get lost while reviewing them. The Owon SDS7102’s USP has a near flawless design. It would be impossible to find a scope at this price point that we cannot pick nits with. But when compared to other higher priced models which may be an overkill for a beginner or a student, this is a great buy with a practical design and very useful features. You can use it to measure the operating properties of line-power harmonics, circuits, and power conversion units such as linear regulators, autotransformers, and switched-mode power supplies. For power analysis, you will need differential amp probes. Also, they can be used for serial data analysis because serial data signals are moving towards digital data formats. You can use an oscilloscope to analyze and represent data formats such as Ethernet, Bluetooth, SCSI, FireWire, and USB. Serial data analysis is applied in the automotive industry. They can also be used as educational tools whereby you use them to help students learn about electric waves and functioning through an oscilloscope. Theoretical explanation and analysis of such electric signals cannot enlighten students better as practical devices like oscilloscopes can do. Another use of Oscilloscope is in jitter application. High-bandwidth circuits in this modern age have fast signals and clocks. You can use these tools to analyze, represent, and debug signal timing and jitter for clocking applications. To debug analog outputs. An oscilloscope is much like a multimeter with the difference being that it has more features, including real-time analysis. You can connect the sensors of this tool before sticking to a circuit to debug the referent outputs of sensors. An oscilloscope is also used for data storage device testing where you test disk drive designs by assessing media noise, disk performance, and optimal recording characteristics. For collecting data- one of the most common features in oscilloscopes is that they can export data in CSV format. The USB disk interface facilitates that. You can pull out data in CSV format and transfer it to excels and spreadsheet where it can be used for waveform analysis. As a rule of thumb, you need to purchase an oscilloscope that has a bandwidth 5X (five times) higher than the peak frequency of the signal you intend to measure. This ensures precise representation of the waveform. However, oscilloscopes with high bandwidth are quite expensive, and therefore you have to compromise on other aspects. Stay away from analog scopes unless you are a collector. An analog scope, has few, if any, advantages over their digital counterparts. In fact, no manufacturers make new analog oscilloscopes nowadays because of their limited performance. Digital scopes store captured sample waves and points in their memory. The amount of memory a scope has determines how long it can store a signal before dumping it. This can limit the sampling rate of a scope if there is insufficient memory. This becomes noticeable when zooming in on a signal. 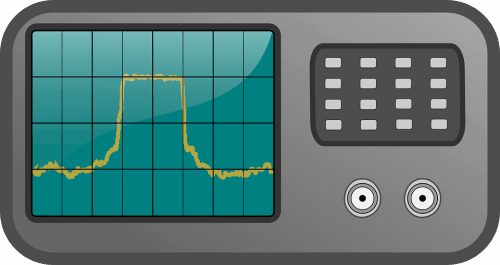 Most oscilloscopes have two sampling modes and rates; RTS (real-time sampling) and ETS (equivalent-time sampling). These are expressed in mega- or giga-samples per second. When evaluating scopes, ensure you know the type of sampling a specification applies to. Manufacturers often list their specification higher so as to make them look good. However, ETS sampling only functions with recurring signals as it builds wave-worms over sequential acquisitions. If your signals are mostly transient, varying, or single-shot, you can only use RTS sampling, which normally has a couple of magnitudes lower than ETS when it comes to the sampling rate. Many oscilloscopes are designed for digital signals and therefore have a resolution of 8-bit. To view an analog signal such as automotive, environmental monitoring, or audio, you will need to go for a 12-bit or 16-bit scope. The higher the resolution, the higher the accuracy you can achieve. For instance, a 16-bit scope can achieve an accuracy of 1% while for 8-bit, the accuracy of the scope will be between 3-5 percent. A traditional 2- or 4-channel scopes may not be sufficient to view all the signals you desire. A mixed-signal scope provides 2-4 analog channels and 16 digital channels. This eliminates the need for special software or a combination of oscilloscope solution and logic analyzer to isolate an activity. Probes of oscilloscope should at least match its bandwidth, but some manufacturers skimp when it comes to this. Make sure you get the accurate probe for your application. For high voltages, use a distinction isolated probe. For very fast signals, use an active FET-amplifier probe. For those who would like an oscilloscope that can work outdoors, consider getting a PC-based oscilloscope module that can plug into your PC. Handheld oscilloscopes are hard to read outdoors as they have small displays and limited battery life. Their main advantage is that they are rugged and small and as such can be used in external environments where a laptop can be too fragile to carry. 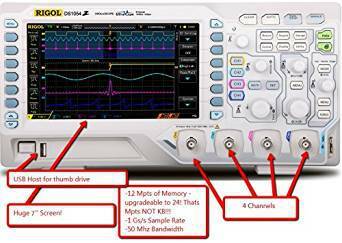 With these tips, you can be able to choose the best oscilloscope for your needs.